So many Halloween costumes are totally cute but don't offer much when it comes to warm layers, except for that Mother Hubbard costume your aunt Sally used to wear every Halloween. That was. . . interesting. But anyway, enough about your Aunt Sally. We're talking about getting serious about keeping your arms toasty this October. Whether you're going as a witch with long sleeves or a zombie that went through its transformation while wearing a sleeveless prom dress this hoodie is there for you to keep you both warm and on topic! 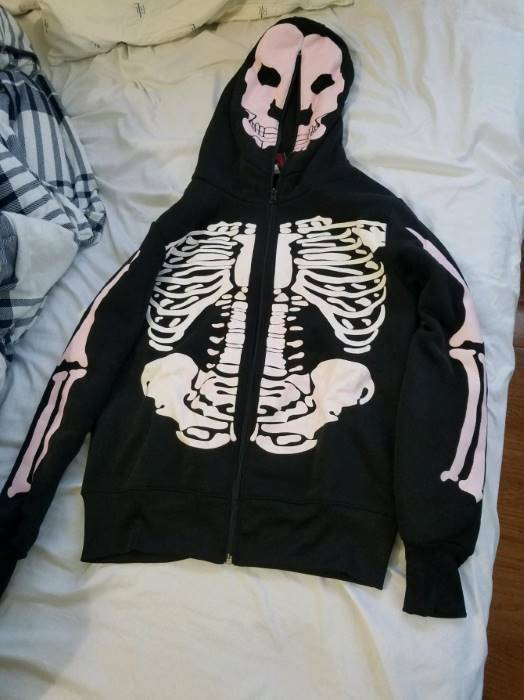 This hoodie with a pink printed skeleton torso on the front is made of a comfortable fleece. The hood zips all the way up so that you can have this hoodie stand alone as a costume in a pinch. It even has eye holes so that you'll be able to see! Bonus! So, whether you're using this as the main component of you're All Hallows Eve ensemble or you're layering up for a spooky night out, you'll be glad you covered up in the bone-chilling October wind! Had to return. Not hot pink. Pale pink on sleeves and ribsc were white with just some speckles of pink paint. Also pants weren't included. Should have read description more closely but both bring in photo was misleading. Still waiting for refund. Hi there! I'm so sorry to hear about the quality your sweatshirt arrived in, it definitely looks like you got a defective one. It appears that we refunded your order in full after you returned it, due to the defect. If you have any questions or concerns, feel free to reach out to us in Customer Service! Sorry again about this! There was a miss print on the hoodie. The arms were pink and the chest was white so I sent it back. Never got a refund and they said I would. Hello! Thank you for your input. Our apologies for the miss-print on the hoodie. In further checking your order information, it does show we received the hoodie back and it was refunded in full on 11/19. Best regards.